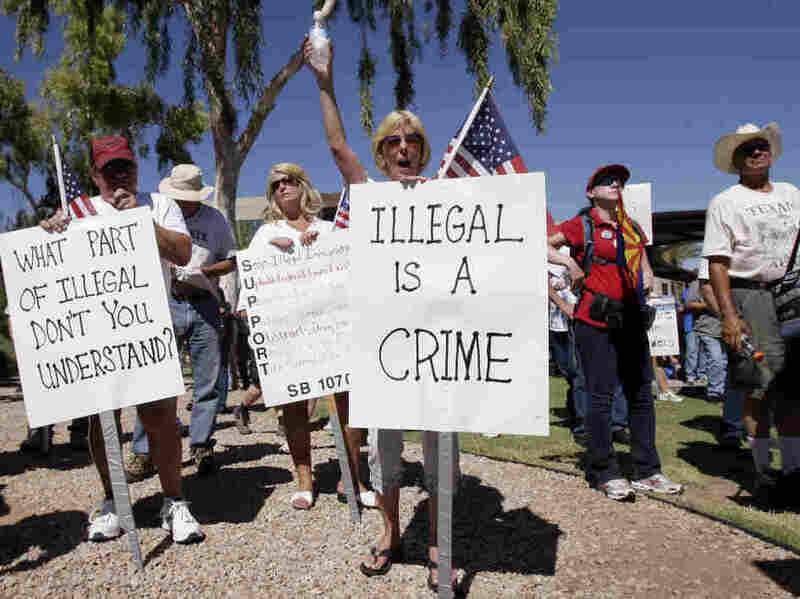 Judge To Hear Arguments On Arizona Immigration Law : The Two-Way A federal judge in Phoenix was hearing lawsuits against Arizona's new anti illegal immigration law. Lawsuits against Arizona's controversial new anti-illegal immigration law were getting their first court hearings Thursday in federal court in Phoenix. The courtroom of U.S. District Susan Bolton had become the epicenter of the fight over the new law, with Bolton taking up the question of whether to issue a preliminary injunction to stop SB 1040 to keep it from taking effect July 29 as scheduled. Arizona's Gov. Jan Brewer and proponents of the law, which gets more support than not in national polls, say the legislation is constitutional because it merely tracks with federal law. The law allows law-enforcement officers in the state who have stopped individuals for other reasons to ask them about their immigration status. Arizona officials say they are training police so they make their requests legally and without racially profiling individuals. But the ACLU and other civil-rights organizations filed their lawsuit challenging the law as unconstitutional. Shortly after the law was passed in May, the ACLU brought a legal challenge to it with several other civil rights organizations. One of the plaintiffs in our challenge is Jim Shee, a U.S.-born 70-year-old American citizen of Spanish and Chinese descent who has already been stopped twice by local law enforcement officers in Arizona and asked to produce his "papers." If the Arizona police are already exhibiting this behavior, it's pretty easy to see that this extreme law, which practically begs police to engage in racial profiling, will lead to unnecessary police harassment of citizens based solely on the fact that they may look or sound like they are foreign. How else would police form a suspicion that someone was not in the U.S. legally? Thursday afternoon, Bolton was scheduled to hear from the federal government which has filed a lawsuit to stop Arizona's law from going into effect. The federal government argues that the Arizona law impinges on its supremacy in immigration matters, an argument rejected by Arizona officials and the new law's supporters. About 120 spectators gathered in the courtroom, some standing ina second-floor gallery. Approximately 30 protesters prayed outsidethe courthouse before the hearing.